I need you to make it server and client based so we can add the achievements to it. There will be achievements for skilling, pvm, pvp and misc. Then tasks like easy-medium-hard-elite. So if the task will be "chop 32 magic logs at the woodcutting guild" it should only work at the woodcutting guild. 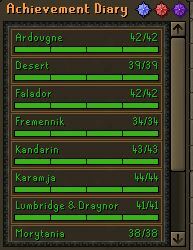 IF finished the task would be green, like it does on osrs. I'll deliver an amount of achievements. If it is not possible for you to add the achievements we can do it ourselfs. Please PM me your discord to talk about further details. Last edited by Fluxious; 02-10-2019 at 08:54 PM. doubt youll find anyone thats willing to actually implement the tasks. im sure u can find someone to do the interfaces and the core for the system, but the tasks themselves are aids to implement and require one to go through all corners of the source. Yeah i knew about this, but its not completed and i cant code it myself. Hmm okay, but i think if the code is written right we can do it ourself? Bump, changed thread a bit.